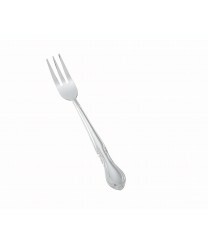 Featuring durable, long-lasting construction and a sophisticated look, the Winco 0004-07 Elegance Oyster Fork, Heavy Weight, 18/0 Stainless Steel will add a lovely touch to your meal presentation. With its classic three-prong design, stunning finish and delicate pattern, this oyster fork set is perfect for serving oysters and other appetizers in restaurants, hotels and at catered events. This fine-crafted set of 12 oyster forks is made of 18/0 stainless steel, so it will resist rust and corrosion over time.